The little craft's demonstration mission could lead to big things. The 4-lb. Mars Helicopter will travel to the Red Planet with NASA's next Mars rover, which is scheduled to launch in mid-2020. An autonomous mini-helicopter will fly with NASA's Mars 2020 rover mission, which is scheduled to launch in July of that year and land on the Red Planet in February 2021. The bantam chopper is a stripped-down technology demonstration, and it will make a maximum of five short sorties in the Martian atmosphere. Success in this pioneering work would be a big deal, extending the reach of humanity's robotic explorers, which are currently restricted to the surfaces of alien worlds or the dark realms far above them. 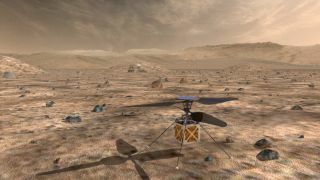 "We envision helicopters opening doors to new types of exploration on Mars," Håvard Grip, flight-control and aerodynamics lead for the Mars Helicopter, said Wednesday (March 20) during a presentation with NASA's Future In-Space Operations (FISO) working group. One day, more-advanced versions could serve as scouts for rovers or explore the Red Planet on their own, added Grip, who's based at NASA's Jet Propulsion Laboratory and the California Institute of Technology, which are both in Pasadena. "In the future, we could imagine doing things like [engaging in] regional exploration using multiple helicopters or going to inaccessible areas or biologically sensitive areas using small helicopters," he said. The Mars Helicopter weighs 4 lbs. (1.8 kilograms) and has a body about the size of a softball. It carries a range of avionics and communications gear, a small solar panel, rechargeable lithium-ion batteries, "survival heaters" to keep its electronics warm through the frigid Martian night, and a navigation camera. The helicopter doesn't have any science instruments, but it is outfitted with a high-resolution color imager. "That's, so to speak, the payload," Grip said. "That's what we [use to] take pretty pictures and send them back to Earth." "The flight model is built and more or less tested," Grip said. "The Mars Helicopter's initial flight will represent that planet's version of the Wright brothers' achievement at Kitty Hawk and the opening of a new era," Susan Gorton, manager of NASA's Revolutionary Vertical Lift Technology project, which has been working with the Mars Helicopter team, said in a statement last week. "For those of us whose research revolves around all things related to flight, that would be a remarkable, historic moment," Gorton added. Such historic moments may not be limited to Mars' skies. NASA is considering launching a quadcopter lander to Titan, Saturn's huge, haze-enshrouded moon. This mission, called Dragonfly, would fly from spot to spot on Titan, investigating the complex chemistry occurring on the potentially life-supporting moon. Dragonfly is one of two finalists for a mid-2020s launch slot under NASA's New Frontiers program of medium-cost missions. The other contender is a comet sample-return mission called CAESAR. NASA is expected to announce its selection later this year. NASA's Mars 2020 Rover Is Unique. And So Is Its Paint Job.